S I G N & D I G I T A L G R A P H I C S • June 2018 • 69 Hewlett Packard's Worldwide Headquarters Last year, the welcome center at Hewlett Packard's world- wide headquarters in Palo Alto, California, went through a massive rebranding. Transforming the welcome center from a conventional design to something that would elicit gasps from the public, involved six different large-format graphic projects, including 38-foot wall murals, oversized window graphics, and multi-dimensional wall treatments. Over the course of nine months, SpeedPro transformed HP's long corridors and glassed-in meeting rooms into award-winning "habitats," such as a home habitat, office hab- itat and an office-of-the-future habitat. The pictures best tell the story here, but the idea was to immerse employees and visitors in inspiring and thought-provoking surroundings. And if three businesses adopting experiential graphic designs is a trend, what would six businesses constitute? 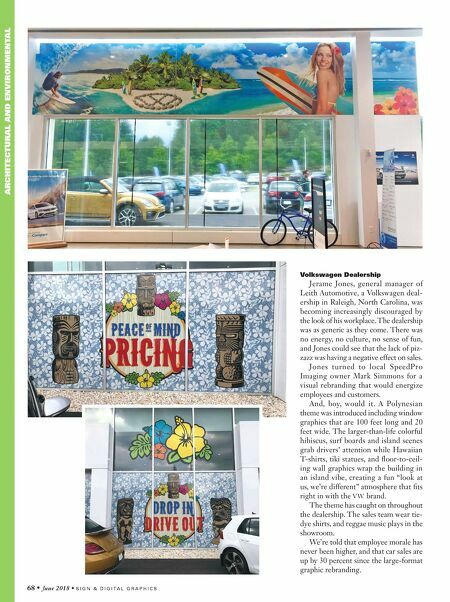 Steve Moran-Cassese, the local owner of the SpeedPro Imaging Marin location that rebranded HP, has also blanketed walls with large graphics in Silicon Valley for Google, Facebook and Cliff Bar. His large wall murals and wall coverings have been printed on materials that can mimic any finish such as silk, suede, metal or wood. 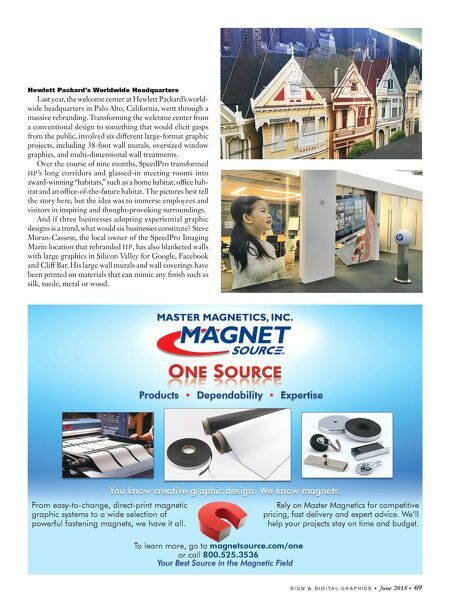 To learn more, go to magnetsource.com/one or call 800.525.3536 From easy-to-change, direct-print magnetic graphic systems to a wide selection of powerful fastening magnets, we have it all. Rely on Master Magnetics for competitive pricing, fast delivery and expert advice. We'll help your projects stay on time and budget.